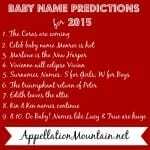 Can I Use This Bad Guy Name for My Baby? What do those names have in common? They all belong to famous fictional villains, from Dynasty, The Karate Kid, and the Halloween movies. And they all appear in the current US Top 1000. Not every name with a negative association becomes unwearable. On the contrary – the right villain can make a name soar. So let’s say that you’re seriously considering a baby name borrowed from a fictional baddie. How do you know if it’s burdensome? Or if it is just one small association that shouldn’t stop you from using your favorite name? Here are six questions to ask if you’re deciding whether that bad guy name works for your baby. Bad Guy Names: Is the character really that bad? Or do we just love to hate him? Alexis was an up-and-coming name for girls when Dynasty introduced the villainous Alexis Carrington in 1981. (Name trivia: the character was originally named Madeleine!) Alexis surged into the US Top 100 in 1982, and reached as high as #3 in 1999. No bad guy penalty there. But then again, Alexis Carrington wasn’t exactly evil, and the glamorous, over-the-top drama of Dynasty was hard to translate to the real world. We loved to hate Alexis, and we didn’t mind naming our daughters after her, either. Bad Guy Names: Is the character well-known? I’m binge-watching iZombie at the moment, where the first season villain is an entrepreneurial blonde zombie called Blaine. That made Blaine my bad guy name pick for Villains Week yesterday. And yet, I’d never tell anyone to skip the name because of the zombie. After all, the television series isn’t exactly Dynasty. Plenty of villains will only be well-known to fans of a comic books series or television show, and not the general public. The risk is that comic books and television shows sometimes become far more successful than we initially imagine. Even minor characters can be reinvented and get story lines that become major pop culture references. But often we can safely say that a name remains wearable, even if we first discover it on a bad guy, if only because the villain isn’t a household name. 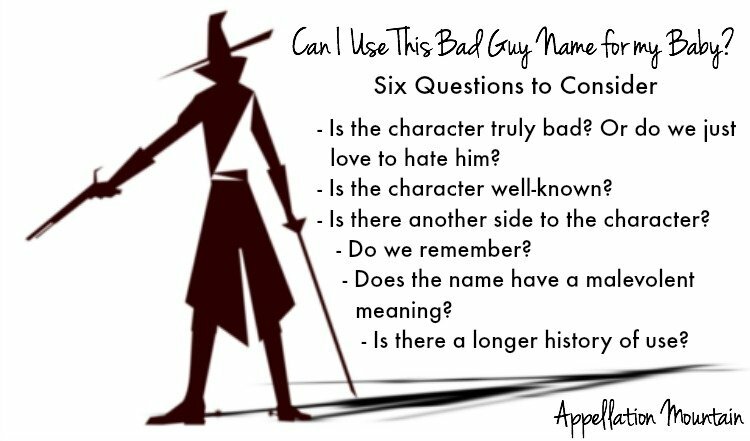 Bad Guy Names: Is there another side to the character? The monster in Beowulf was re-imagined by John Gardner in Grendel. And we all know the backstory of the seemingly all-evil Wicked Witch thanks to Gregory Maguire’s Wicked. While there are still plenty of one-dimensional bad guy characters out there, a surprising number of our villains are colored gray. While Lucius made my list of baby names featured this week, I don’t think that Empire’s Lucious Lyon counts as an irredeemable villain. He’s more of an antihero. If the character is complex, and shows herself to be capable of good and selfless acts, too, it’s a safe bet that the name will feel more wearable. Bad Guy Names: Do we remember? This is a tricky question. If you’re a twenty-something first-time parent, odds are that you won’t recognize the same villain names that someone in her forties or fifties will. If those associations are strong, your child could face a generation of teachers and coaches who can’t shake their surprise at meeting a kid called Anakin. Your Darth Vader is just plain different than their Darth Vader. Other characters fade, though. One of the most memorable 80s movies bad guys might have been the sensei of the Cobra Kai dojo in The Karate Kid. The character’s name is John Kreese, but I think of him as wrapped up with Cobra Kai – and hence, the name Kai takes on a sinister cast. But only when I really remember the movie, and the final scene with a smug Cobra Kai sensei shouting “Finish him!” as an injured Ralph Macchio stands on one leg to defeat his black-clad opponent. Bad Guy Names: Does the name have a malevolent meaning? 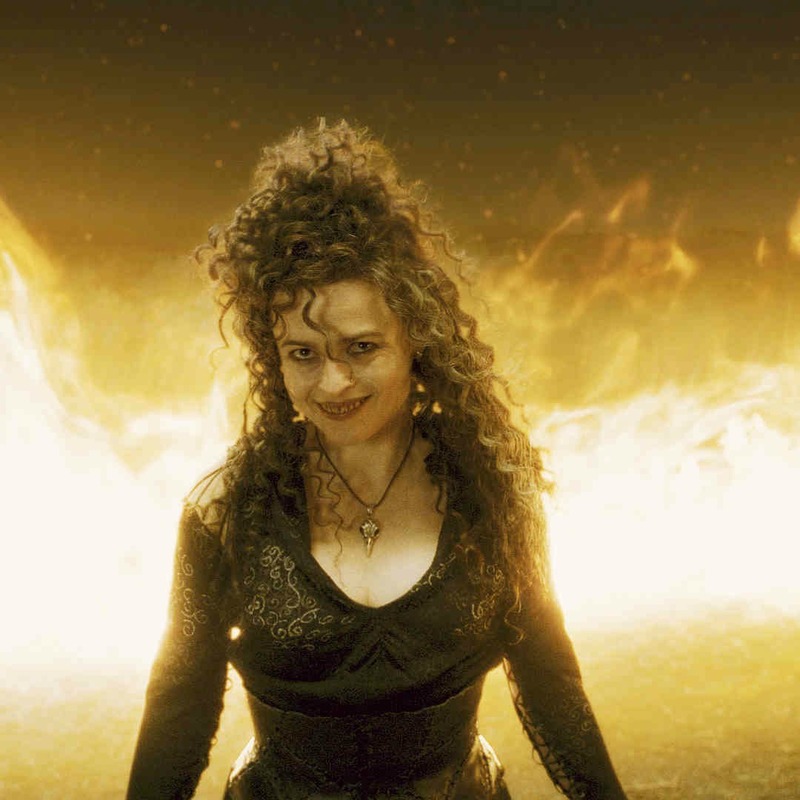 In the Harry Potter universe, Bellatrix LeStrange is a straight-up bad guy, a madwoman intent on evil. And yet, Bellatrix means woman warrior in Latin. 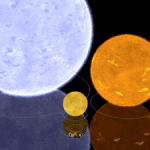 Like many of her family members, her given name is borrowed from a star. So even though Bellatrix went to her death on the side of the purely evil Lord Voldemort, there’s nothing about the name that implies darkness. Instead, there’s plenty of embrace to like the name. Maleficent, on the other hand, was the perfect name for an evil queen. It’s a portmanteau of the Latin mal – evil – and traditional names like Millicent. It’s also the opposite of beneficent – an adjective describing a person, institution, or act that results in good. Can you have a good character called Maleficent? The 2014 movie starring Angelina Jolie gave the queen a completely different backstory, and her Maleficent ultimately saves the day. And yet, the origins and meaning of this name render it unwearable for a child in a way that Bellatrix does not. 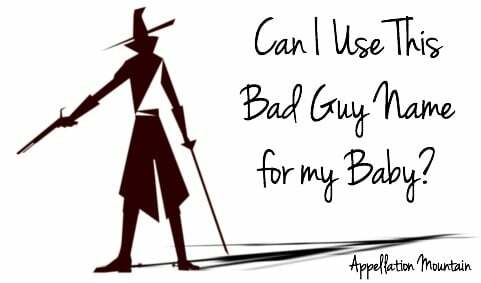 Bad Guy Names: Is there a longer history of use? Often the challenge isn’t the name’s origins, the popularity of the story, or even the character. Does the name have significant history that predates the bad guy? There were three popes named Lucius, as well as more than one saint. If I hear the name on a child, I’ll probably guess that the family is Catholic. That’s true for so many bad guy names. Michael might be the terrifying murderer who menaced Haddonfield in 1978’s Halloween – and many a sequel – but it’s a traditional name for boys, popular long before the movie debuted, and not tainted by the association. Jason is straight out of Friday the 13th, but it sailed with the Argonauts long before it starred in a slasher flick. Perhaps that’s why names like Anakin and Bellatrix seem so outlandish when given to a child. They were first heard as given names on a character that wasn’t exactly admirable. 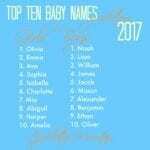 It’s a little less of a stretch to name a child Atreyu or Katniss – even if the names are novel and attached to fictional characters, they’re ones who we admire. And yet, sometimes all it takes for a name to graduate from flat-out crazy to perfectly wearable is a generation of parents willing to overlook a character’s flaws. My advice? Tread lightly, but don’t rule out a name just because it fails a few of these tests. Does a name’s association with a fictional bad guy give you pause? Or are bad guy names fair game? I’ve never understood why some folks feel names like Damian and Ursula are “evil” and unusable, simply because they were in fairly recent movies. That doesn’t suddenly cancel out thousands of years of positive history. My middle name is Ursula, and I’ve always defended it to people who think only of some stupid cartoon witch. For a good association to the name Dorian. J.D. on the TV show Scrubs was named Dr. John Dorian. Aside from Dorian Grey, I always think of him when I hear the name. Dorian nicknamed Rory? That’s fabulous! I’d use it. FWIW, I don’t think the nuances of the story of Dorian Gray are well known … just the general idea. And I think Dorian fits so well with popular names for boys today – Adrian, Dylan – that it would wear well.